This recipe comes courtesy of one of my wonderful readers, Diana. I was intrigued by this recipe for multiple reasons. I remember when I was a teenager I had found a recipe similar to this in a cookbook from the 1950’s. I was intrigued by it then (and baked it) and I’m intrigued by it now! Why is this recipe so unique? It’s EGGLESS, has only 1 Tbsp of fat and doesn’t require a mixer. Score! So, for all of you vegans out there, this can easily be made into a VEGAN lemon spice cake by using vegetable shorting or oil for the fat. The texture is not exactly like regular cake because it doesn’t have the egg but for a low fat, vegan treat, it’s pretty amazing!! Surprisingly moist and flavorful! Yeah, it still has a ton of sugar but, eh… you gotta pick your battles. The original recipe that Diana sent me uses lemon extract but I had none so I used the zest from a lemon instead. It turned out really good although I’m sure the lemon extract would have had more of a punch. If you want to use lemon extract, just add 1 tsp when you add the butter and cider vinegar. Thanks again for the recipe, Diana! It turned out fantastic! 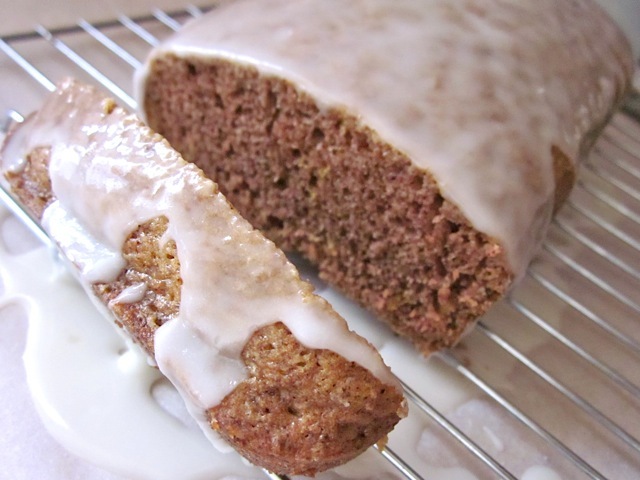 This sweet and spicy Lemon Spice Cake requires no egg and very little fat! Use vegetable oil or shortening to make it vegan. Placing parchment paper or foil under the wire rack before glazing will help with clean up. 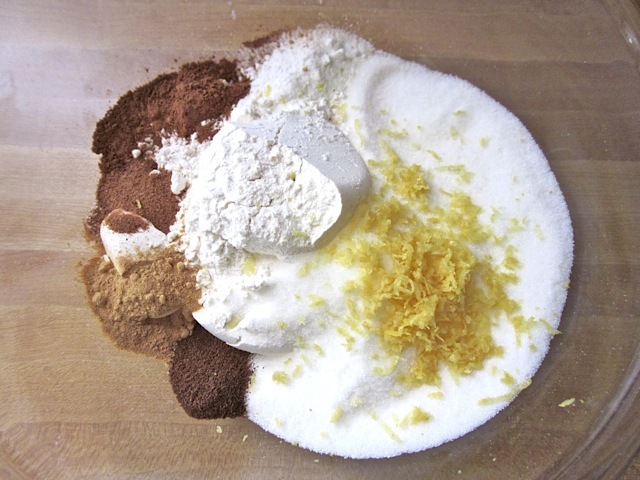 In a large bowl, combine the dry ingredients: flour, granulated sugar, baking soda, cinnamon, nutmeg, ginger, salt, cloves and lemon zest. Stir until combined. 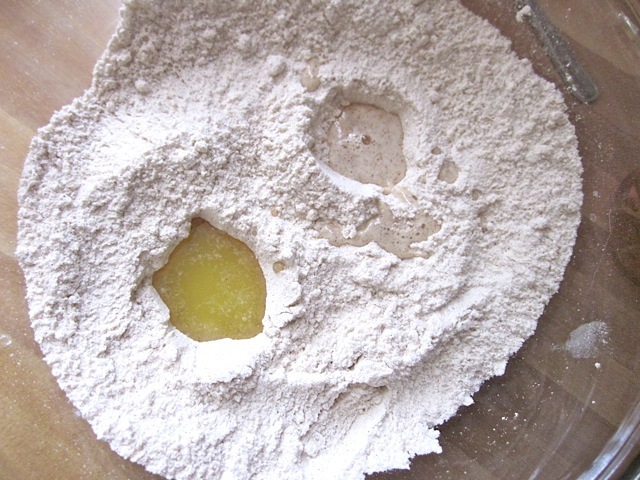 Make two wells in the dry ingredients and add the cider vinegar to one and the melted shortening or oil to the other. Pour one cup of water over top and stir just until combined. There may still be lumps but that is okay, you don’t want to over stir. Just make sure there are no large pockets of dry material. You can either bake this in an 8×8 dish and then cut into square or bake in a loaf pan and slice. I don’t have an 8×8 dish so I used a loaf pan. 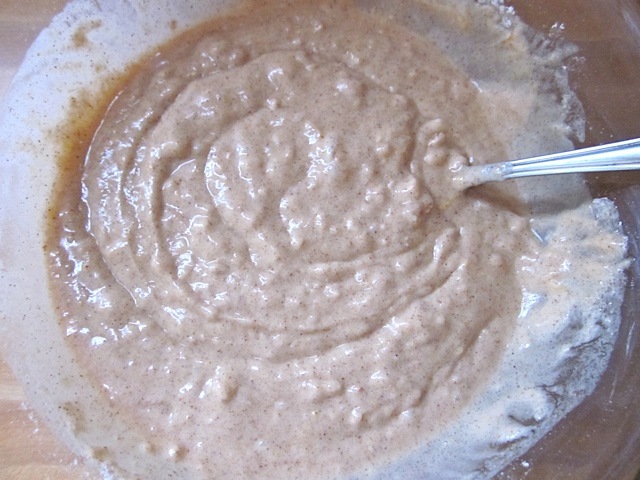 The batter will be shallower in the 8×8 dish and you will probably only need to bake for about 30 minutes. In the loaf pan it was deeper so mine needed to bake for about 40 minutes. Bake in a preheated 350 degree oven for 30-40 minutes. A good indicator that the cake is cooked through is when small cracks appear on the top. If the top is still indented slightly, that means some of the batter is still liquid. 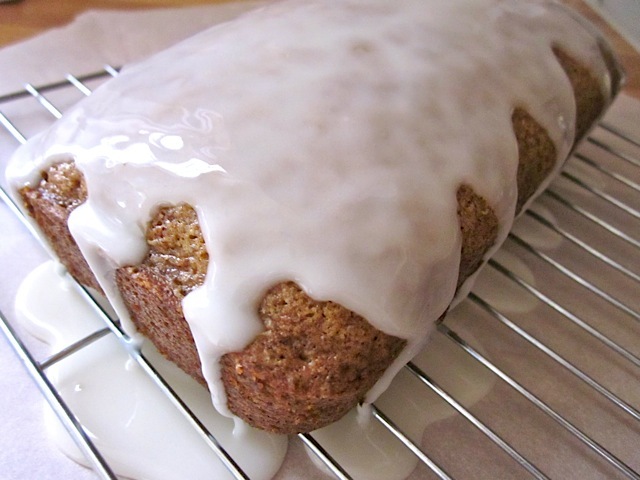 While the cake is cooling, prepare the lemon glaze. Place the powdered sugar in a bowl and then add the juice from the lemon. 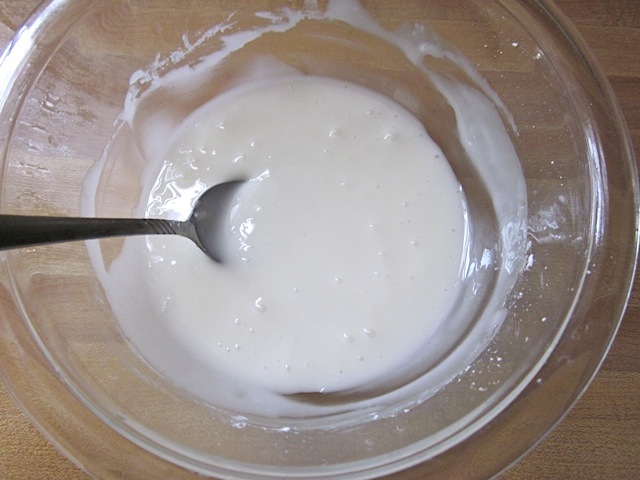 Stir until it is a smooth glaze. Wait until the cake has cooled, place parchment or foil under the wire rack and then pour the glaze over top. This came up on my Facebook feed a couple of days ago, I’ve only just realised how old the post is. I ran my 200th parkrun this morning, something that NEEDS to be celebrated in the pub after with cake. I made this! I looked in the oven at just over 30 minutes baking, it sort of looked done but I thought it could do with another couple of minutes, oops, I made the mistake of sitting down with the iPad. 20 minutes later I remembered the cake. Anyhow, I glazed it and took it to the pub this morning. 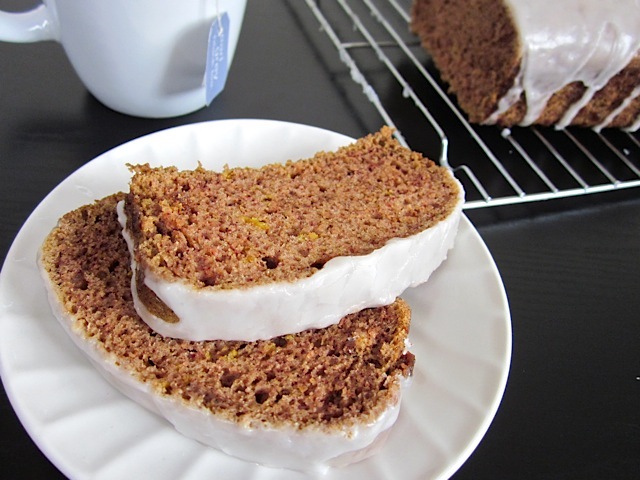 Still fabulously moist inside, tasted fantastic, got rave reviews! I didn’t have any ground cloves so bashed 4 whole cloves to smithereens, I was worried that it would be a bit overpowering, but no, it was lovely. I’m trying to expand my baking to include treats suitable for eggless and/or vegan diets, and this cake was a resounding success! 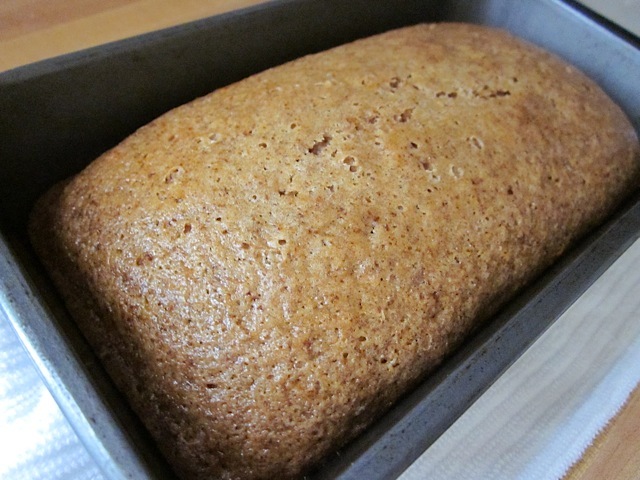 It baked evenly, rose nicely and relatively uniformly, has good, spicy flavour (though not particularly lemon-y without the glaze), and has a good texture. I don’t think I’d guess it was eggless or only had 1 tablespoon oil if someone baked this for me; the texture was lighter than I anticipated! Thank you to Diana for the recipe, and thank you, Beth, for getting permission to make this post and share this! I made this cake last night. 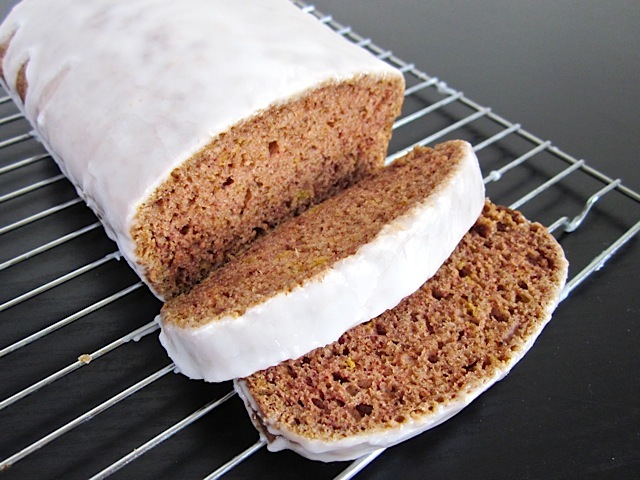 Normally, I love spice cakes, but I just wasn’t sure about this one…until this morning. 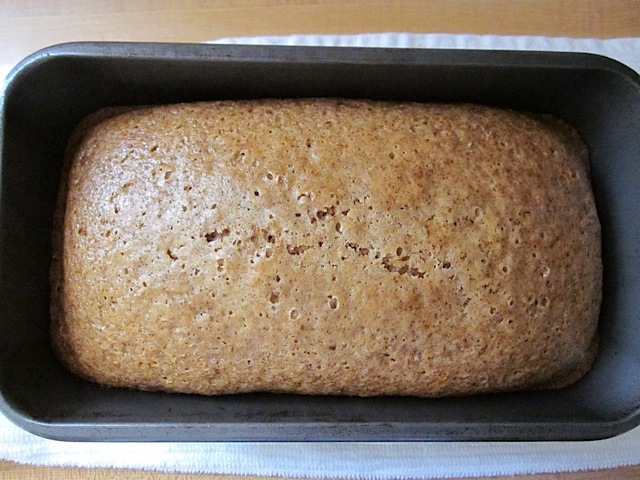 I used a metal loaf pan and baked it for about 45 minutes (it took awhile for the top to be completely baked). Unfortunately, the sides and bottom of the cake ended up almost hard, and I found the topping way too sweet. My husband loved it, so I put the cake in a plastic bag on top of our refrigerator. This morning, I tasted it again. 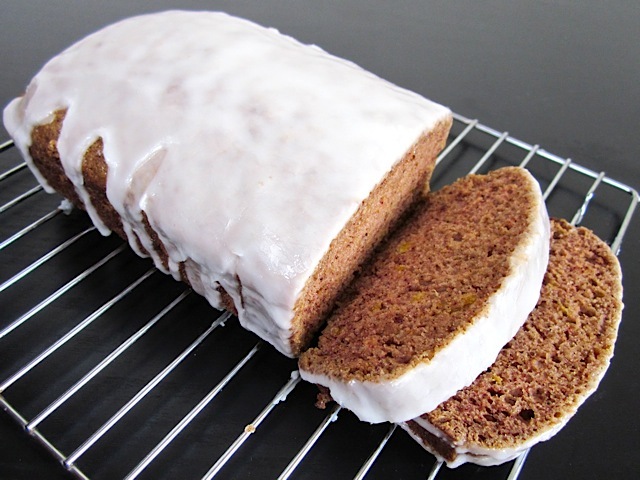 Overnight, the cake’s hard exterior became soft and the sweet icing mellowed. Now, I loved it too! This looks great! I was thinking about making some baked goods for my students (one of them is a vegan), do you think I could pour the batter into a cupcake tin for easy serving? Hmm, I can’t think of why it wouldn’t work, although the baking time will probably need to be reduced. This reminds me of the chocolate wacky cake mom always made as it too doesn’t use milk or eggs. The process of mixing the dry ingredients and making wells sounds the same. What you get is a nice, moist chocolate cake which everyone raves over. I’ll be sure to get her version of the recipe and share it. This is in the oven now. SOO easy to whip up. I used butter b/c w/so many quick cakes/breads I taste the oil, no matter what. I gave the bowl a batter lick after pouring into the pan and it was really spicy – how I love it! The lemon peel gave it an interesting tang. 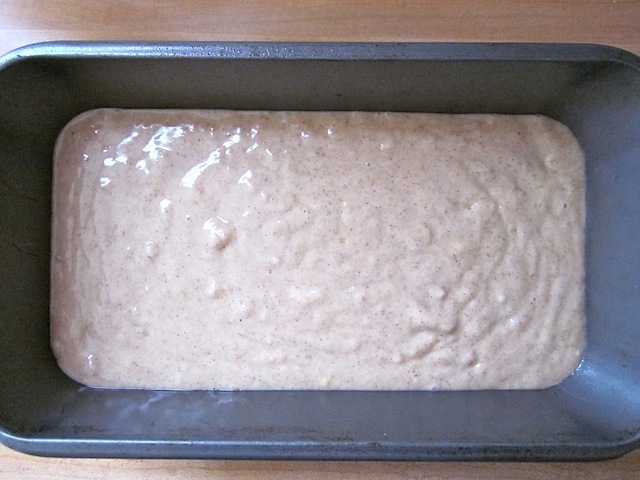 Hoping it cooks up ok in my pyrex loaf pan. Great way to use up some spices of mine that sit there and sit there! I did like how the whole thing can be dairy free and even vegan. Lauren – That would probably work. You’ll just need to use mini loaf pans and reduce the baking time, although I’ve never done it myself so I’m not sure what to reduce it to. Hello, Im new to baking and such and was wondering if there is a way to make mini loaves for gifts with this recipe? I love your blog as I’m sick and need to stay away from most processed foods. You make things pretty simple. I tried this recipe twice, the first time my husband opened the open and it completely collapsed in the center. After I scolded him, i tried again. The second one collapsed too, what am I doing wrong?